We love Euros. The clean, interlocking mechanisms. The multiplayer solitaire. And don't forget the thrill of playing as Mediterranean merchants for the 100th time. But sometimes we just wanna kill something with our friends. And Mistfall wants to fill that void. In today's review we'll find out if Mistfall has what it takes to be the co-op dungeon-crawler we're looking for. Let's check it out! Cards--Nearly 400 of them. Everything from Feats and Gear, to Enemies and Events. 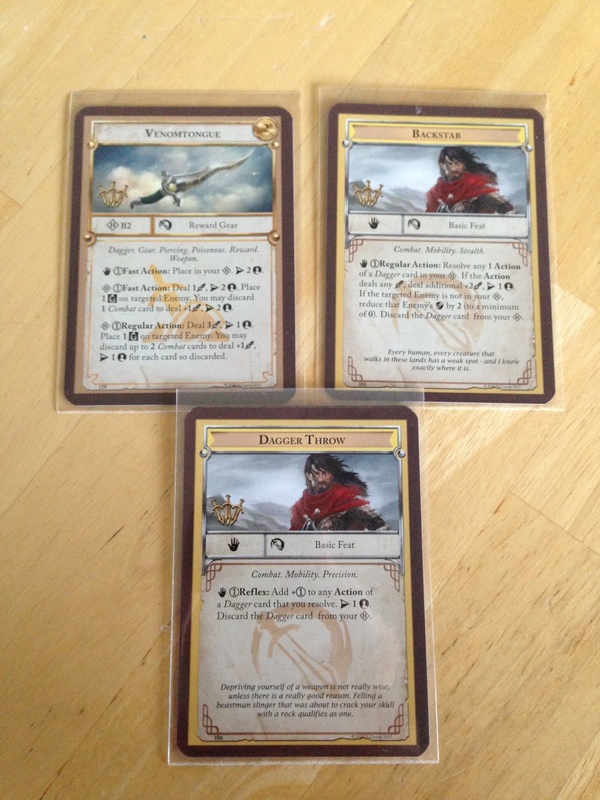 Tokens--These show wounds, Resolve, Objectives, and conditions. Jeremiah--It's a very, very full box; lots of cards, bits, and such, and well worth the price! First you'll choose your Quest and Heroes, and then there's all sorts of setup for Location tiles, Hero decks, Rewards, and Enemies. Finally, you draw five cards (your starting hand limit), and away you go! Quests might include getting to a certain Location and clearing it of Enemies, or defeating a certain powerful Enemy. 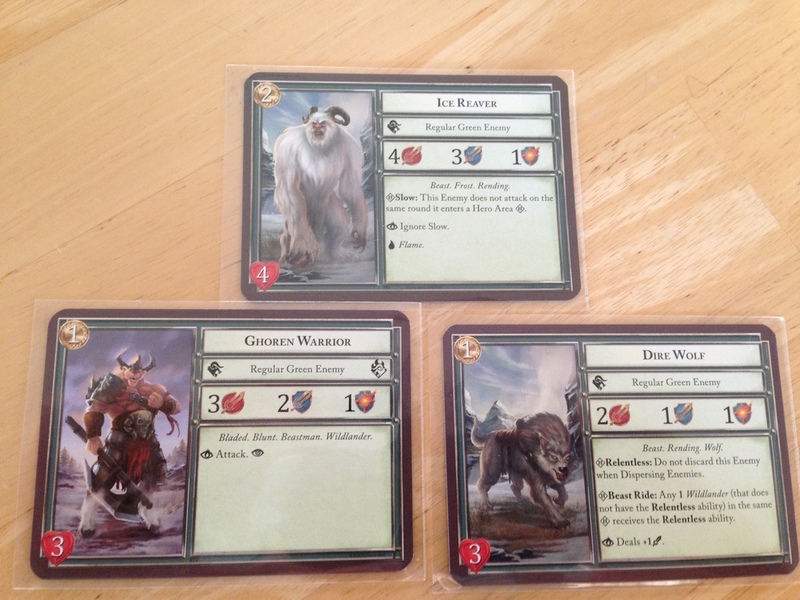 The base game comes with four Quests, and the Kickstarter came with an additional two. There's a TON going on here, so we're going to give a (relatively) quick overview of a round, without getting into all the details of the different types of enemies, and tracks, and so forth. If there's an active Encounter in play, you'll bring in new Reinforcements (enemies). Here you'll decide if you want to move the party to a new Location. You can leave an Active Encounter, but there will likely be a retreat penalty. Now you draw an Encounter for the new Location, and bring out Enemies. Each Location also has a special power that might affect Enemies or attacks or defense. This is where the Enemies move to engage the Heroes. Each Hero has an Enemy Focus track, and the next enemy will go to the Hero with the highest Focus. Once that happens, you divide the position number on the Focus track in half, and round down. Enemies won't move to a Hero whose Focus is zero. In this way, enemies will mostly evenly attack the Heroes. 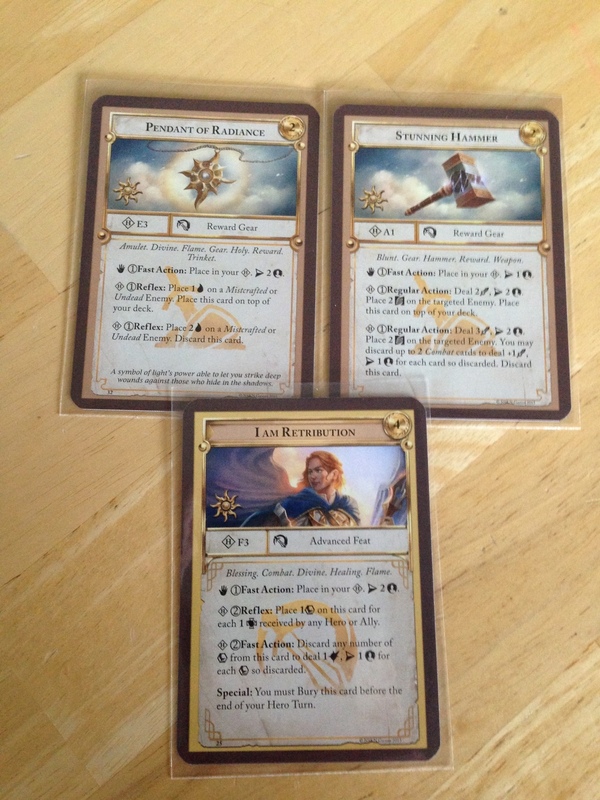 Firestone--This piece feels very much like The Lord of the Rings: The Card Game. But the similarity ends there. It's a mechanism for divvying up Enemies, so I don't know how it wouldn't seem derivative. But I feel as though you have more control over which Enemy will go to which player. Not always, of course, but you can set yourself up to take certain Enemies, since ties on the Focus track allow you to decide where that Enemy goes. Jeremiah-- I thought the same thing. Hmmm...sounds like the threat tracker. But being able to play cards that jack up your focus in order to snag the baddest of the baddies gives you some control over that, and your focus is much easier to pull down. It's very fluid in the gameplay, which isn't always the case in LOTR. This is the meat of the turn. Players decide which Hero will activate, and that player takes his or her entire turn. Once every Hero has activated once, the phase ends. Players will have a handful of cards, including Gear and Feats. Each Hero has starting Gear that are already down on the table and ready to use. These are things like Daggers, Hammers, Scrolls, and Talismans. The Feat cards are special moves or powers that you play into a discard pile. They often work in combination with Gear cards you have in front of you. Regular, which you can take once during your turn. Fast, which you can take any number of times during your turn (provided you can meet the conditions). Reflex, which you can take at any time--including on other people's turns. You'll use these Actions to attack and (hopefully) defeat the enemies in your play area. You can also spend the group's collective Resolve to buy Advanced Feats, which are extra-cool special powers, and which go directly into your hand when you buy them. Firestone--Yeah, and it's a tough call. Someone will say, "Look how awesome my 3-cost Feat is! I need to buy mine!" And then everyone compares their cards and you realize that everyone's 3-cost Feat is awesome. So you definitely have to sacrifice, and be strategic about who buys and when. There are ALL SORTS of specifics I'm glossing over here, that pertain to dealing damage, wounds, vulnerability, conditions, and different types of Enemies. It's all a lot to keep track of, but never feels overwhelming. This is where Enemies attack the Heroes--and introduces perhaps our favorite mechanism in the game. If Heroes damage Enemies, the Enemies take Wounds until they die. That's typical. But if Heroes take damage, they might be able to cancel some of that damage with armor or a card, but for each point of damage they do take, the Hero must move a card from his Hand, Discard pile, or the top of his Draw pile to a Burial pile. This card is out of the game. So in Mistfall, when a player heals, either through the card-play of, say, a Paladin, or when they Rest, they get cards back into their Discard or Draw pile. Each "point" of Restoration lets you move a card from the Burial pile to the Discard pile, or from the Discard pile to the Draw pile. This is the only way to get your Discards back, and makes for interesting and tense decisions. Jeremiah--Yeah, super-tough decisions hinge on this mechanic. Do I wait to heal because there are some sweet cards I haven't drawn yet? Or do I heal up so I don't get smashed into oblivion and tank the whole game? Love it! Players check to see if they've satisfied the conditions of the Encounter. If so, they follow through with the Encounter Aftermath (which is specified on the Encounter card), and Rest. If not, you move on to the next Phase. Players draw a Time card, move the Time marker the number of spaces marked on the card, and then resolve any affects on the card, which are usually bad. If you reach the last spot on the track, you lose! You repeat all of this until either you lose the game, or you defeat the Special Encounter. Firestone--Mistfall is not for the faint of heart. There's a lot going on, and a lot to keep track of here. But it never feels overwhelming, and it's worth it. Mistfall is a good game. Firestone--As I mentioned, I think my favorite thing is how cards are your life, but that there are clever ways to get that life back. Timing, order, and good choices can stave off death and despair. Jeremiah--The concept is very cool. If you're on an adventure, battling who knows what, and you can no longer perform an action to help you and/or your squad, you're done for! Firestone--Ultimately, the game is about trying different combos, and figuring out how to work the timing to your advantage. Meanwhile, the game's throwing curveballs at you, and you have to figure out how to deal with new threats and events and difficulties. Once you hit on an amazing combo, it feels fun, because you're really powerful. Jeremiah--I think that's an aspect that lies outside the learning curve. There's a slow curve to understanding and feeling comfortable with mechanics, gameplay, turn/phase order etc. (And the rule book doesn't help much... We'll chat about that more shortly.) But really getting to know your character, and the cards you have available at the start and those you can acquire later, is when the game really turns the corner from, "Oh this is a cool fantasy game," to "LOOK MOM! I just took down three monsters with this amazing feat of agility and deadly blows!" Firestone--I've never played the Pathfinder Adventure Card Game, so I can't speak to the similarity. I can speak to the similarity to The Lord of the Rings: The Card Game, and while there are some things that are very similar--drawing enemies to you based on the value of a track, progressing through Locations based on tokens, and so forth--it does feel different. For one, Mistfall has far more bookkeeping and things to keep track of. Secondly, LoTR has more varied quests. Mistfall is: kill a bunch of bad guys on your way here to kill this Big Bad Guy. And the cards-as-life mechanism is completely different. All that to say, I don't think they're similar enough that you couldn't play both. I would love to see more variety in upcoming Quests. Killing stuff is fun, but can't we mix it up a little? The artwork is very well done, and I love the variety of both Enemies and Heroes. Firestone--It should be noted that there's a fair amount of errata that slipped into this first edition of the game. None of the errata is major, but it's enough that you have to look over it before every game, and before every scenario. In my first game, I played Ardenai, and I couldn't figure out why in the world I would choose to use her Dagger. Afterward, when I looked at the errata, I saw that the card's current wording makes it underpowered. As long as your're aware, and look at the errata for a Hero you might be playing, or a Quest you might be on, before you start, it's nothing more than an annoyance. Jeremiah--Yeah, I honestly think there should be a rewrite/reprint of the rule book--it would improve the game experience greatly. Or even a glossary of keywords would be helpful! I will say this: for all the errata and frustration that comes with it, it says something about how truly fun the game is that my group (myself included) still really enjoyed it and look forward to playing through all the quests! Firestone's Final Verdict--I like Mistfall a lot. Sure, the errata is annoying, but don't let that stop you from playing this solid co-op adventure. You really do feel like a group of adventurers heading into danger, and facing down the big baddie together. And that's just fun. Jeremiah's Final Verdict--Mistfall is a deep fantasy co-op for true gamers. New wrinkles to familiar themes and mechanics make this a must for any fans of the genre! 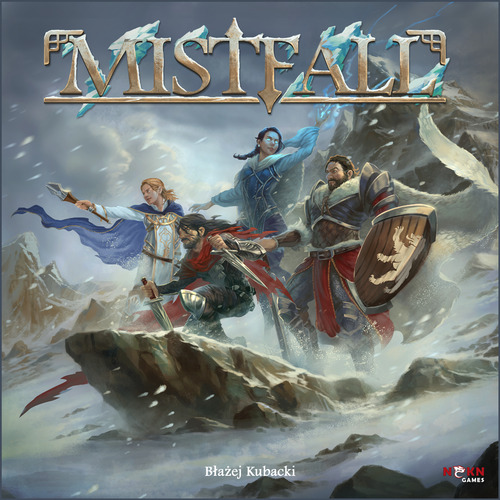 Theology of Games would like to thank NSKN Games and Passport Game Studios for providing review copies of Mistfall. This in no way affected our opinions of the game.